This article was checked by Colxfile. Thanks for his work. The game is, unlike Vice City, situated into another country. You keep at disposition the whole state. The game take place in the 1992, when a black man named Carl Johnson is getting back to Los Santos town. He is stopped by corrupt policemen on the way from airport. They don’t shoot him, they take his money, and throw him from the car during the drive. The only thing around, that you could call vehicle, is a bike. When he gets home, he’ll find out that his mother has been murdered, other family members are dead and the whole gang is falling apart. The cherry on this cake is that the same corrupt policemen will blame him from the murder. But Carl is hard guy and decides to take the destiny into his own hands. He wants to get reputation, friends, family, clear his name and at the end take a control of the whole San Andreas. Big Smoke has been waiting at your house with a gun in his hand. At first he wants to kill you, but then he recognizes you and takes you to a cemetery, where your mother is interred. Once there you’ll find also the rest of your friends and family, or what remains of them. You’ll go for a short ride around the city with Ryder, who’s your friend. You’ll meet Old Reece barber, who knew your mother. You’ll also try to break into a shop, but you’ll soon discover that you should earn bigger money by another way. You’ll meet your brother Sweet on the second day, and head over to the enemy’s area belonging to the Ballas gang. Re-spray few notices, kill some gangsters and – last but not least – smash the seat of a drug baron. At the end you’ll help your brother in a gun battle, but that’s normal in family. You are now in a garage, where a special car with hydraulics is waiting for you. You’ll take part in a really cool contest. You’ll win it by jumping your car according to music. As soon as you win the bet, you’ll meet with friend Caesar. He’ll let you in on some of the problems of Los Santos and you’ll show him that you’re still a good driver, because you’ll win a smaller illegal race. When you are home, you call Ryder, who wants you to rob an army base with him. But first, rob the villa of a soldier, where you can find lots of ammo and other. Then assail a train with some other stuff, and at the end, visit the base in question. Everything is ready, but for what? Nobody knows, except for Ryder. The last friend you didn’t do anything for is Big Smoke. He’ll ask you to go and get Jeffry out of prison. He is mad at a guy, who squealed on him. So go and take him down. Although it was an exhausting day, Smoke won’t let you relax and give you another guest. You should go to “visit” a drug boss, but he’ll unfortunately run you away. So you must chase him and … well you know, what to do. The last guest is quite easy, take down a bunch of guys on a train and kill a few mafiosi in a hotel. That’s the end of the busy day. Now, Jeffry will ask you for your assistance with someone, who has begun to call himself OG Loc because he wants to be a rap star. Crazy. At the moment, he works as a cleaner in a fast food restaurant, so I'm not sure how far he will rise up the fame ladder. However, he has no money and without it, he'll only be able to rap at home, in the bathroom! So, you'll visit a beach party, steal the hi-fi and speakers. as well as some cases, get rid of a rap competiton and steal a few well-known rap lyrics from Mad Dog. Jeffry, meanwhile, will start publicising himself. He doesn't need to clean out toilets now, but he does need help taking out some stinking trash. He'll invite you to a party where the Ballas gag will rush you. It seems that a war has started. Now we know what Ryder needed those weapons for. You'll receive other tasks from corrupt police officers you met at the beginning. You don't want to work for them, but your reluctance may mean a return to jail, and you really do not want to be there again. So you'll have to burn down gang headquarters, which causes problems, but there will be a little girl left behind. From now on she is your friend. Well, it is something at least. The second mission is a little bit more demanding, but nothing that you can't do. You'll shoot down a few Ballas's and mafia members, as you have done before. A gang war is in full swing, and Sweet wants to return some lead at high speed to those guys who attacked your party. You'll make a small attack, but you'll hit the main stronghold of the Ballas gang - Glen Park. But you need to weaken them. It's best to eliminate the leader or someone high up in the gang. You will learn that one such member will be in the cemetery. Therefore, you and the brother with a couple of guys, will go to kill him. It seems that the war is over and the city is now peaceful. You'll go to the hotel to celebrate, but the party is going to be interrupted by a couple of SWAT squads. You'll escape the police. That was close. Sweet thinks that you have been left in a very bad way by Ballas's, therefore, he wants to shoot down a few of them in retaliation. Caesar will call you now, and you must come immediately. You will see how Ryder, Smoke, corrupt policeman Tempenny and Ballas's are cooperating. You will notice that the brother is in danger: you're going to help him. He gets shot and you will be caught by the police. Tempenny will take you to the countryside, where he wants from you to do a few tasks. A guy with the adversaries of the police, so you must get rid him. He's guarded by some agents, but so what? After a while Caesar will call you, to tell you that his cousin needs a partner for some action. You will help her rob a few businesses, but on every occasion, something goes wrong. She will fall in love with you, could she be your next girlfriend? No, no, she is different. She's capricious, but you will see it for yourself. Truth with burning some ground used to grow marijuana, then you will go to San Fierro. As soon as you arrive to San Fierro you will set up your own service department. Just get some mechanics and that's it. You'll attempt to get driver's license, buy motor show and rob some car shop. Let's just filch some luxury cars and sell them. That's some real income, unlike robbing pizzerias with Ryder. Oh, how's he going? Doesn’t matter, I don't care about rats anymore. But sister will come together with Caesar to help you with running car-service. You will take some photos of baddies with Caesar and pleasant Woozy (Wu Zi Mu) will tell you who those guys are. You will handle some stuff for one of them - Jizzy, but you will kill him anyway. Another from crew of baddies is T-Bone Mendez for whom you will save agent Torreno. Yes, you will work for him and government as well. Neither officer Tempenny will stop bothering you and forces you to rub out some useless guy in Los Santos and his informer. Real battle approaches. You and Caesar will arrive at pier, bring down few enemies with the assistance of Woozie's guys. You will finally dispatch T-bone Mendez and Ryder as well. Last remaining foe is Torreno, whose helicopter will be taken down by your innocent weapon. Rats are gone, let's play. You will buy a toy store and accomplish some crazy missions. You will help Woozy in return when all is done. He's got couple of tasks for you, which lead to elimination of Vietnamese gang messing up local traffic. So you will meet another Chinese - Ran Fa Li whom you will help to escape the city, which will bring you respect from all the Chinese mafia. You will get an anonymous call and get invited to the cottage in desert. In that cottage you are going to accomplish some mission with Monster truck. Than you will take over some truck with Caesar and accomplish other missions suddenly finding out that you still work for Torreno, who you’ve tried to kill. Anyway, you just helped him to get some important materials and he will forgive you your little vengeance. You will get your own airport than, which becomes your home. You will move on by getting pilot’s license and again completing some missions for Torreno and your will also visit Area 51, where all odd experiments and researches are under way. Woozy will give you a call again, but you will be already considered as his partner and close friend and you will be invited to his new casino in Las Venturas. There you help again with some tasks, but rival casino appears - Calligula casino. You have to get rid of it, preferably rob it. There you will meet Ken Rosenberg, Kent, Paul and Maccero. But suddenly another complication pops up - mafia gang of don Leone from Liberty City. You’ve got to do some job for them, so Woozy will have just enough time to prepare for that robbery. Even you will help him to get some necessary stuff. Don Leone left Las Venturas and it’s your chance to rob him. It passed smoothly and bunch of money is yours. Tempenny gives you a call again but you better kill both of his colleagues to get rid of him. Woozzie’s guys will help you to take over some mansion in Los Santos. And that’s how your invasion to LS begins. Back in Los Santos. You have new house up on the hill, from which you will lead expansion attacks to enemy territories. City is under control of Ballas and Los Vagos gangs. Your ex-gang is almost lost and brother locked up. Luckily Torreno reappears and he will set your brother free in exchange for some job. You are coming back home to reunite Groove gang. Tempenny comes on stage again and cranks up chaos all over the city. Buildings burn, residents are plundering, police shoots everyone they spot and army barricades city exits not to let spread it out. You will clean up the streets and with Caesar and his gang capture his territory back. Than you will conquer other territories and once more your gang will become strong. Retribution time is coming. You will hold up some party, kill loads of gangsters and finally execute Big Smoke. Tempenny tries to escape but even he will die in pursuit. 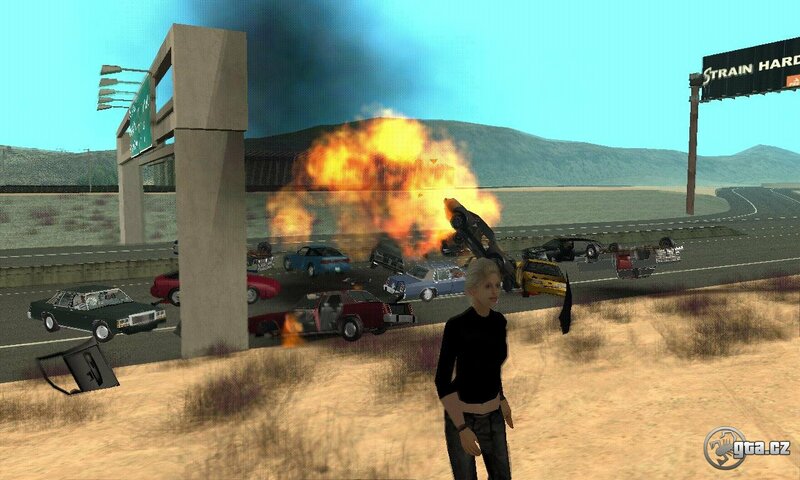 That’s how San Andreas ends up. Family all together, peace around and you can live your own life placidly.